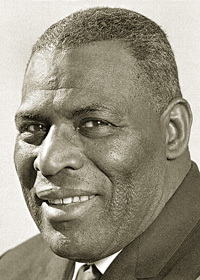 Better known as Howlin' Wolf, Chester Burnett was an influential blues singer, songwriter, guitarist and harmonica player. Although his masonic membership is unconfirmed, a photograph of Burnett taken by Brian Smith in 1964 shows him wearing a masonic ring. The following correspondence is also worthy of note. "Wolf was an active member of the Masons in Chicago and perhaps even earlier in the South. I have been told that many Chicago bluesmen were active in the Masons, especially in the 50s and 60s, including Sunnyland Slim and Magic Slim among others. 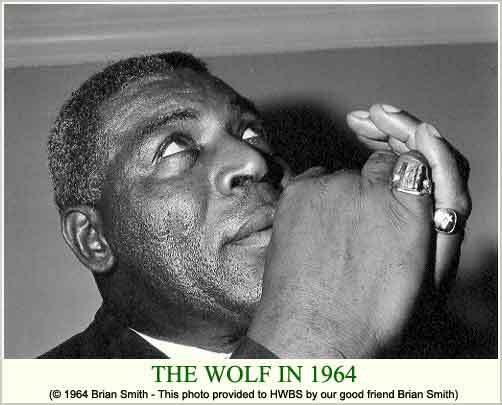 Even one of the several Wolf imitators, Lil' Howlin' Wolf (Jessie Sanders), is an active Mason and often wears a belt with a Masonic buckle. He was in the Masons in Chicago with Howlin' Wolf." Quotation from personal correspondence received from James Segrest (11 June 2007). Freemasonry is not mentioned in Moanin' at Midnight: The Life and Times of Howlin' Wolf , James Segrest, Mark Hoffman. pb: 352 p. New York : Thunder's Mouth Press, Avalon Publishing Group, Inc., 2005. 8.9" x 6" ISBN-10: 1560256834.